Some like it heavier than others, and the Rocktron Reaction Distortion II pedal takes it to that higher level of heavy. This is distortion and gain with a unique voice that is controllable and adjustable. Gain is the hallmark of the Reaction Distortion II. A highly adjustable and dynamic EQ allow you to dial in that specific tone. The main EQ consists of a dual BASS and TREBLE control. We've provided a high range of sweep on these two controls. Next, take a look at what is possible with the FOCUS control to cut through on stage and shine through even the muddiest live mix. The FOCUS control brings you and your instrument front and center like never before! The awesome FOCUS control adjusts the symmetry of the distortion, causing the sound to "jump" out of your amp! Other control knobs for the Reaction Distortion II include DRIVE, which controls the amount of distortion drive you desire. LEVEL controls the output volume of the Reaction Distortion II. BASS (outer control) provides low-end frequency sweep. TREBLE (inner control) handles the high-frequency sweep. 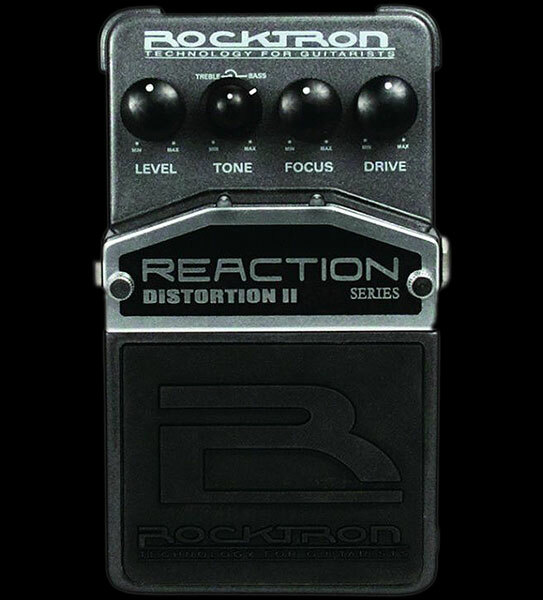 Like all Rocktron Reaction Series pedals, the Reaction Distortion II is built into a rugged metal slim form factor chassis, taking up as little space as possible on your pedalboard. The Reaction Distortion II is a TRUE BYPASS pedal: when you turn it off, it is out of your signal path! The footswitch for the Reaction Distortion II controls On/Off status as shown by the LED indicator. Reaction stomp boxes run on a 9V Alkaline battery, or may also be powered by Rocktron's DC OnTap Universal Power Supply adaptor.